Spread Testicular Cancer Awareness This April! If someone were to ask you when Breast Cancer Awareness Month is, we’re sure almost all of you wouldn’t hesitate to answer: October. Breast cancer is one of the most common types of cancer affecting over 1 in 8 women worldwide, and throughout the entire month of October, you see the symbolic pink ribbon everywhere you go. But, did you know that April is Testicular Cancer Awareness Month? If not, then you’ve come to the right place. Although testicular cancer is considered more rare, it is still the most commonly diagnosed cancer for men ages 15-44, and affects over 6 in 100,000 men per year. So, what exactly is testicular cancer, and why should you care about it this Testicular Cancer Awareness Month? The entire month of April is dedicated to shining a light on testicular cancer. Many of us know people who have been diagnosed with the disease or who are survivors of it. That’s why it’s important to encourage others to understand the risks associated with it and warning signs to look out for. Many credible organizations promote and recognize Testicular Cancer Awareness month as an opportunity to raise awareness, educate the public, and push men to be advocates for their own sexual health. There are also opportunities for everyone (including you!) to get involved and aid in the efforts of the Testicular Cancer Foundation. According to the Testicular Cancer Society, Testicular cancer occurs when cancer cells form in one or both of the testicles. These cancer cells begin to grow uncontrollably and form a giant mass or tumor, and can spread to other parts of the body, including the lymph system. Although the exact causes of testicular cancer are unknown, risk factors include abnormal development of the testicles and having had a family history of the disease. Signs and Symptoms: The most common sign of testicular cancer is the formation of a lump, pain, or swelling in the testicles. If you notice anything unusual, you should notify your doctor immediately. Severe symptoms can include neck masses, trouble breathing, stomach problems, lower back pain, nerve pain, or bleeding. Many people also often complain of a dull ache or “strange” feeling in their lower abdomen or groin. Risk Factors: Even though this type of cancer can affect men of all ages, it is especially common in young men aged 15-35. White men are also 4.5 times more likely to develop testicular cancer than black men. Certain conditions may also put men at risk, including Cryptorchidism, which is a condition in which the testes fail to descend from the abdomen into the scrotum. Men with a history of a non-descending testicle are 3 to 17 times more likely to develop testicular cancer than those who experience normal teste development. Treatments: The good news is, testicular cancer is one of the most curable forms of cancer and is highly treatable, with a 95-99% survival rate. The earlier is it detected, the easier it is to treat. Treatments can range from surgery to radiation therapy to medication. The type of treatment that is used also depends on the stage the cancer is in, as well as the individual’s preference. Men’s Sexual Health is Important Too! 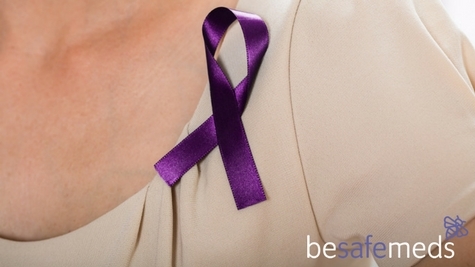 As an online STD treatment provider, besafemeds constantly pushes the importance of sexual health. In addition to providing private STD treatment, we also aim to spread education and awareness on sexual health-related issues. We know that many times men’s sexual health can get overlooked. That’s why we think it’s important to spread awareness about testicular cancer this April. Just as we encourage getting tested for STDs at least once a month, we also encourage monthly testicular exam to detect testicular cancer and prevent it from spreading. For more information on Testicular Cancer Awareness Month and ways you can observe, visit the Testicular Cancer Foundation’s website.